Increase your vocabulary and you’ll make your writing much more precise. That’s why I provide a word of the week. Today’s word: Gaeltacht…. An Irish writer of literary fiction, Colum McCann was born in Dublin but now lives and works in New York. I was deeply impressed by his 2009 National Book Award winning novel Let The Great World Spin and I recently finished his 2015 novella (published with three short stories) 13 Ways of Looking. She relished the Gaeltacht, the shifting weather, the hard light, the wind off the Atlantic. I scratched my head when I encountered that intimidating word, then felt very silly when I finally looked it up in the dictionary. It is an Irish-language term for any primarily Irish-speaking region. (D’uh. Gaelic comes from exactly the same root.) In Ireland, the term Gaeltacht refers individually to any of the districts where the government recognises that the Irish language predominates. 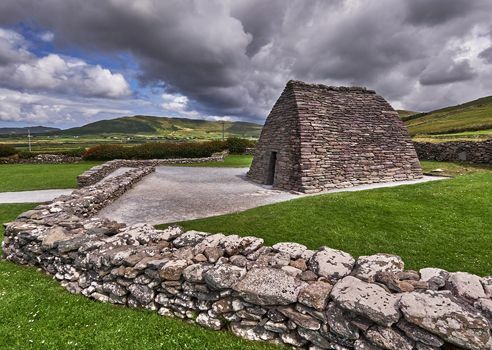 The photo above, by the way, is of the Gallarus Oratory a chapel located on the Dingle Peninsula, County Kerry, Ireland. It has been presented variously as an early Christian stone church by its discoverer, antiquary Charles Smith, in 1756; a 12th-century Romanesque church by archaeologist Peter Harbison in 1970; a shelter for pilgrims in 1994. At the time of the oratory’s discovery, locals attributed it to Griffith More, as a funerary chapel built by him or his family at their burial place. I think it’s beautiful and intend to see it when I travel to Ireland. Soon, I hope!